VA Form 10-0455 or the "Clinical Trial Annual Progress Report" is a form issued by the United States Department of Veterans Affairs. 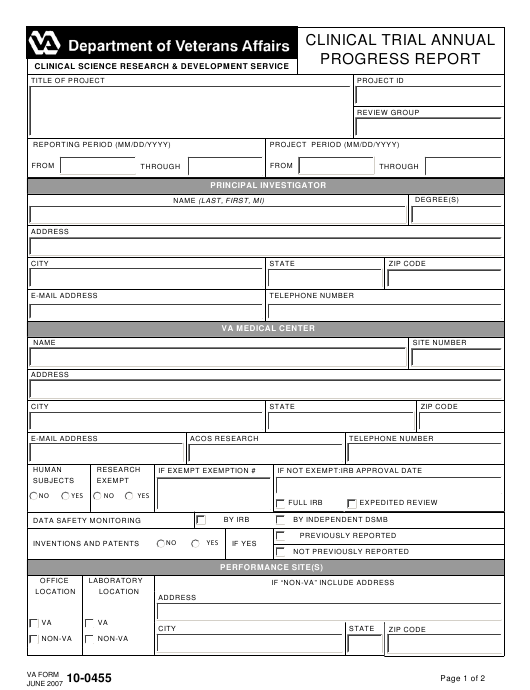 The latest fillable PDF version of the VA 10-0455 was issued on June 1, 2007 and can be downloaded down below or found on the Veterans Affairs Forms website. PROVIDE PRIMARY OUTCOME PUBLICATION CITATION; IF AVAILABLE, PLEASE ATTACH A COPY. IRB AND/OR DSMB MINUTES (MOST RECENT) - ATTACH AS A SEPARATE FILE. PRIMARY OUTCOME PAPER - ATTACH AS A SEPARATE FILE IF AVAILABLE.